Competitor Spot - World class soccer drills, workouts, and advice. Bank robbers is a fun invasion style game for youth soccer players to work on dribbling, quickness, and agility. 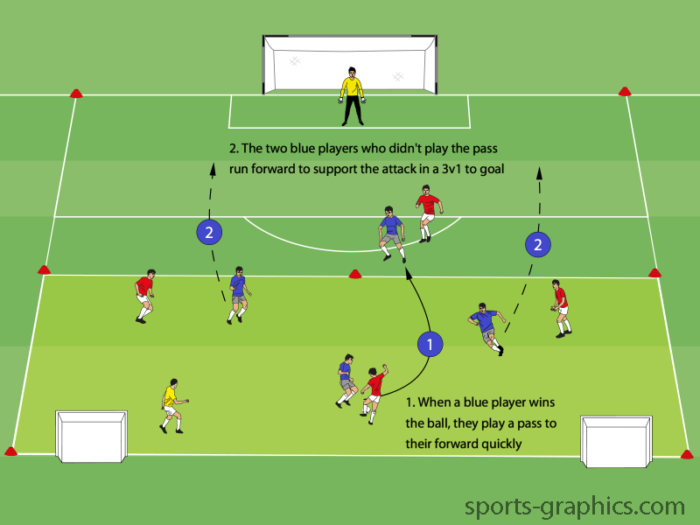 2v1 pick a side is a simple finishing drill that gives players an opportunity to work on delivering quality through passes and tucking away their chances in front of goal. Counter attack with fullbacks is a fun game for players to practice going forward quickly as soon as their team wins the ball. This game works especially well when fullbacks get involved in the attack by making forward runs. Swarm the ball carrier is an excellent drill to help players work on aggressively pressing an attacker to try to win the ball back. This drill was inspired by Barcelona’s six second rule. When Barcelona lose the ball, the nearest two or three players apply immediate pressure for six seconds because this is when the opposition is most vulnerable to lose it. If the team can’t win it back in six seconds, they drop into an organized defensive structure.